Imagine you are in a domestic situation subject to danger. You are forced to flee your familiar surroundings; there is nothing you want more. There is one problem … you need to leave your beloved pet behind in the knowledge that this animal is also in serious danger. What do you do? This is a question that many victims of domestic abuse are dealing with. The problem is that pets are welcome in almost none of the shelters for battered women in the Netherlands. Victims are consequently forced to leave their pet behind or to postpone their escape to the battered women shelter, with all the consequences this may entail. This is unacceptable to IFAW. That is why about a year ago I started the ‘Animal Shelter’ (‘Hands off my animal) project. 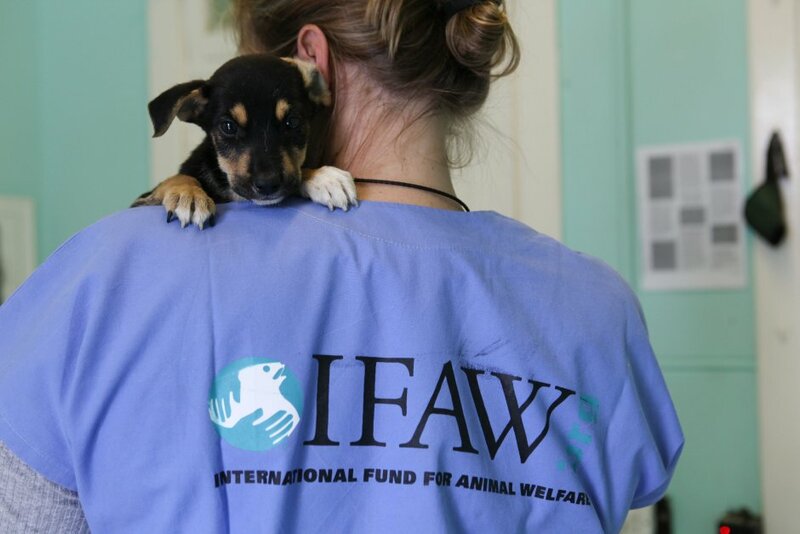 With this project IFAW offers help to victims of domestic abuse by caring for their pets when they decide to flee their perilous situation. The animal is checked by a veterinarian and placed with a foster family. This family will care for the animal until the victim is again in a stable (safe) situation and can again take care of herself and the animal. In the past year I contacted the shelter for battered women Kadera in Zwolle and together we are elaborating the project. For instance, we visited the Foundation Paws for Kids in England that provided us with a very large amount of information about the work that they have already been doing for 16 years: the successful sheltering, placement, and return of pets that originate from a situation of domestic violence. A beautiful initiative that is supported by IFAW and serves as an example for the Animal Shelter. To start this kind of project in the Netherlands, much had to happen. Think, apart from the costs, about finding the right foster families, but also other professionals that you need to deal with: veterinarians, behavioural therapists, animal kennels, animal homes, animal police. Without proper cooperation a project like the Animal Shelter would not be possible. It is with justifiable pride that I can now announce that as from 30 June 2014 the Animal Shelter is a fact. Since that day the shelter for battered women Kadera has actively informed victims about the Animal Shelter and women and their pets can both be cared for. The first pets have meanwhile been placed with foster families. With the support of our donors, but also with the support of many specialists who cooperate with the project free of charge, the Animal Shelter can help these victims of domestic abuse. I sincerely thank you all for that! I will regularly keep you informed of developments within the project.